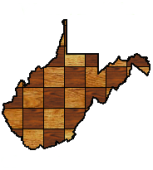 The WVCA was founded in 1941 to foster and promote chess activity in the state of West Virginia. 6 players made the trek to the Mountainlair on January 12 to compete in the 19th Mountaineer Open. Ed Garner finished with 3.5/4 to win clear first place. This entry was posted in Results on January 28, 2019 by wvchess.